Private sale 3528756093 Jacob. 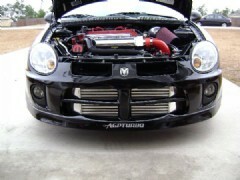 Hard find srt4 one if the few running AGP 3.2zeta turbo largest turbo kit you can get from agp. Not in a rush to sell, love my car drive it to work 3-4 days a week. Tuned at 500hp at 24psi. I"m running around 400 on 18psi to help traction. Has won many shows. Srt4 showdown twice and ifo for cleanest domestic. Cousin bought from dealer for a great deal then sold it to me. Original owner traded it towards an srt8. Professionally Fully built engine, transmission, turbo (warrantee). Awesome deal for what was put into it. Beautiful car no problems, honestly hate to see it go. Asking 14,000. You could eat off it. Engine = Block bored .040 over by Titan motor sports (Ocala, FL.) Pistons = Custom JE (8 to 1 comp.) with vertical gas porting on top comp. ring. Rods = BC Pro rods with 3/8" arp 625+ rod bolts Crank = Brand new OEM, I polished the journals, Rage-tek 4 bolt crank strap kit with DCR crank stud kit. OEM rod/ crank bearings. Damper = ATI super damper. Oil pump = DCR oil pump, DCR big oil filter and DCR oil pick up tube with a custom screen I fabricated. Timing belt tensioner = DCR Billet tensioner Windage tray / crank scrapper = Ishihara Johnson windage tray crank scrapper custom to fit rage-tek crank strap kit. Water pump = OEM Water pump. Head And Intake manifold. Head = DCR pro seris head, Intake Runners are ported out more (gasket matched) to match the DCR pro seris intake that is gasket match ported. +1 Intake vales +2 Exhaust valves, I Polished the cam journals. DCR oil flow modifier. ARP head studs with DCR nuts and washers. Cams = BC stage three cams I polished the journals. Set cams with Bitts tools (Thanks Bitts) Cam gears = Fidanza Polished by me. Head gasket = DCR five layer Intake Manifold = DCR pro seris Sheet metal intake, gasket matched ported, Polished by me. Boomba 70mm throttle body Polished. Upper hard pipe = AGP custom fabricated 3" mandrel bent cold pipe with HKS bov painted and polished by me and 10 gpm meth. nozzle. OEM mopar execpt gauges, data logger. Super clean no tears, burns, ect. Lowered, suspension dialed in perfect to help with traction. No windshield wiper fluid (now the holding tank for methanol injection) passenger window is stuck on child lock has to be let down from driver side. No other problems. Recent compression and leak down tests done to ensure the builds holding good after break in. rebuilt turbo less than 200 miles on it.